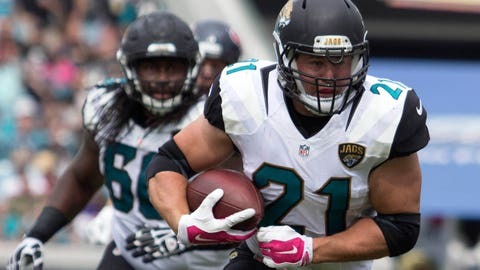 Toby Gerhart ran for 26 yards on nine carries in his first start of the season for Jacksonville. Jacksonville running back T.J. Yeldon, who injured his groin in last week’s loss to Tampa Bay, was declared inactive for the Jaguars’ 31-20 loss to Houston on Sunday. In his place, Jacksonville started Toby Gerhart, who ran nine time for 26 yards in his first start of the season. In all, the Jaguars ran for 83 yards, including a team-leading 37 from quarterback Blake Bortles. Yeldon missed all three of the team’s practices last week leading up to the game. The second-round pick out of Alabama started the Jaguars’ first five games of the season before sitting out. The 23-year-old has run 81 times for 291 yards and caught 15 passes for 73 yards and touchdown this season. Yeldon was one of seven inactive players for the Jaguars, including fellow running back Bernard Pierce, safety James Sample, cornerback Nick Marhsall, defensive end Chris Smith, guard Tyler Shatley and wide receiver Marqise Lee.